Life Before the Dinosaurs: Dicranurus. 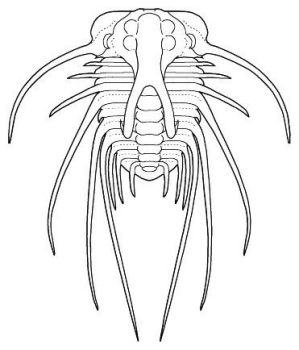 Dicranurus is a bizarre genus of Devonian trilobite. 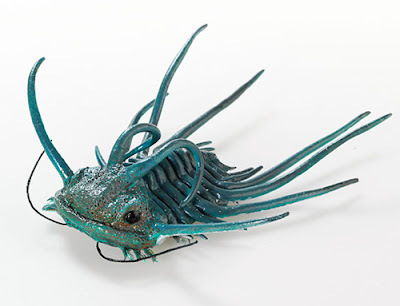 Its name means "twin head-tail," referring to the curled tail-like horns on the head. 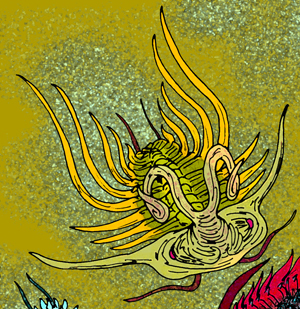 The long spines probably protected Dicranurus from predators such as placoderms, and also kept Dicranurus from sinking into the mud at the bottom of the ocean. Dicranurus lived in the shallow ocean between Gondwana (a supercontinent) and Euramerica (north Europe and North America). This shallow sea is now Oklahoma and Morocco, which is where Dicranurus fossils have been found. Dicranurus was a lichid trilobite, which were very spiny trilobites that lived from the Ordovician to the Devonian. It is distinguished by the two spines on its head.